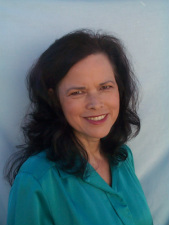 Tricia Deed has a BA in Psychology from the University of Central Florida, Orlando, Florida. Her writing started as a hobby and now Tricia Deed is pursuing a career as a professional freelance writer. Tricia Deed was the originator of Infotrish. “Info’ is for information and “trish” is for Tricia. Infotrish was created in Florida on August 29, 2009 as a hobby and business opportunity information center. She is currently pursuing other types of writing and discontinued Infotrish as of August 2014. This website allowed her the opportunity to work as an affiliate promoting products online. She has written articles which were published on Ezine Articles.com, Go Articles, Article Base, Article Alley, Amazines, Hub Pages, and other article distribution centers via the Internet. Her current hobbies include writing, making beaded jewelry, and acrylic portrait painting. A past hobby which became a stable income was dance and she became the owner of a dance studio. This allowed her to be a performing artist, entertainer, instructor, choreographer, and show promoter. The time arrived when retirement from this full time self-employment pursuit became a reality. Now, she has written an eBook about one question which a student in her classroom had asked; "How do you become more sensuous?" . This book has been published as a Kindle eBook and is titled Belly Dancing - Sensual Essentials and is available on Amazon. com. There are many writing opportunities from her business and personal experiences in Middle Eastern dancing, beading jewelry, acrylic painting, gardening, and much more. Because of her strong interests in arts and crafts, hobbies, recreational and leisure activities, self improvement, business, and more there is no lack of subject matter for this ambitious writer. In her journey of life she has had many experiences which add to a writer's collection of story telling. She has been blessed with many talents and approaches life with eyes wide open and an active adventurous spirit. "Life is too short...live life with gusto". Sign up to receive email alerts of Tricia Deed's latest articles from EzineArticles.com! The art of writing is a craft which requires ongoing attention to learning. One should never stop learning so she is not shy about admitting to the continuous studying and practicing the art of writing. ​Her eBook, Belly Dancing - Sensual Essentials has been published and is available for purchase at Amazon.com. After you read her book she would appreciate a written review, it would be appreciated. 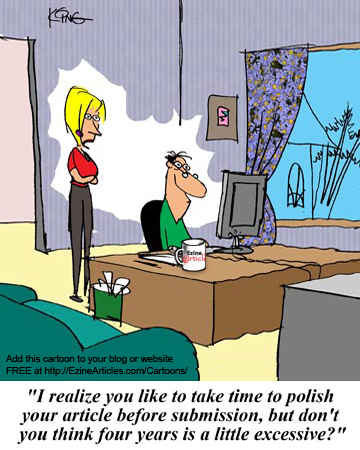 Just like the cartoon to the right indicates, sometimes it just takes time to polish what has been written. But the point is once it is published it cannot be undone. ​Tricia Deed is an active writer for Hub Pages.com and EzineArticles.com where many of her articles are posted.